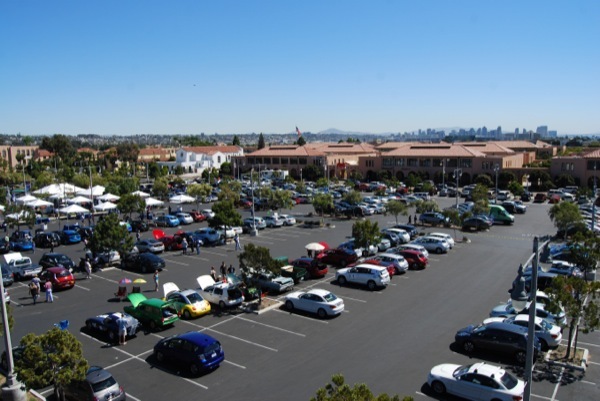 San Diego’s National Plug In Day was a huge success with more than 750 people gathered at the largest electric vehicle celebration in San Diego history. Some 175 EV owners brought their vehicles and attendees took more than 650 ride and drives. The event had huge support from the Plug In 2013 Conference and Exposition held in San Diego, Nissan North America, Chevrolet, San Diego Gas & Electric and the California Center for Sustainable Energy. People lined up to test drive 22 different EVs including the Nissan Leaf, Chevy Volt, Chevy Spark, Toyota Prius Plug-In, Toyota RAV4 EV, Ford Fusion Energi, Ford CMax Energi, Ford Focus Electric, Fiat 500e GEM E2 and GEM E4. Attendees also rode along in two luxury models, the BMW i3 and Tesla Model S. There were 21 companies and organizations with display booths as well. The event opened with a proclamation from City Councilmember Mark Kersey, naming it National Plug In Day in San Diego. • Check out EV chargers and find out more about other plug-in technologies. Learn how easy it is to charge an EV at home or throughout the San Diego region, with more than 500 public charging stations available. • Get your questions answered from San Diego Gas & Electric about special EV rates that can help drivers pay the lowest price for EV fuel when charging from midnight to 5 a.m.
• Learn about state and federal incentives available for zero-emission and plug-in electric vehicles from the EV experts from the California Center for Sustainable Energy. • Find out about life as an EV owner from your neighbors who already have made the switch to this cleaner, more energy-independent vehicle option. REGISTER TODAY TO LET US KNOW YOU’RE COMING! There are currently 486 attendees registered.